Everyone has heard of salt water pools but not everyone understands what that means. Any pool could be converted into salt water but NOT every pool should. We are here to guide you on this decision making process and if you decide to change over we are more than happy to make this happen for you. Salt water pools are easy to maintain and offer a softer more enjoyable swimming experience, continue reading to see if a salt system is right for your swimming pool. 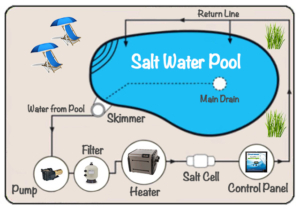 If you view the diagram above you will see that a salt water pool is a cycle of taking salt water from the pool via the pump, passing it through a chlorine generator, this device splits the salt in to sodium and chlorine and puts it back into the pool so that it can sanitize the pool. During this process the sodium and chloride will recombine and the process can start all over again. Because this is a cycle that does not end you do not need to continue to add chlorine each week. Once you get your pool balanced with the proper amount of salt and set your generator to the proper level it will continue to run and produce chlorine. It is also a very pH neutral process, unlike tabs chlorine so you will not have to make pH adjustments as often. Having salt in the water also make the water much softer, so instead of getting out and feeling dried out, your skin will tend to feel softer. As with anything in life, their are good and bad with anything. The main problem with salt systems is that salt is highly corrosive and it will tend to rush or corrode metal. This means that if you have steal walls, (such as an above ground pool or in ground vinyl pool) then salt might reduce the life of the pool itself. Salt can also cause damage to handrails and ladders and other pool equipment. A typical cell will last for about 3 – 5 years, during this time it is import to clean and maintain the cell to ensure it is operating at 100%.